One year has passed since I left Phnom Penh after my IBM Corporate Service Corps assignment in Cambodia had ended. 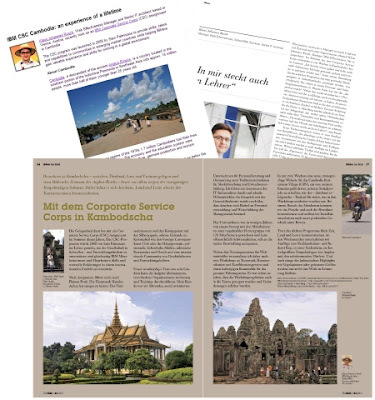 In the following months, I wrote articles about the CSC experience for our local employee magazine and for our corporate social responsibility site. A professional writer covered the story for the THINK! Magazin. Our company internal Global Web Services newsletter featured another article. This one happened to find its way to my client HRINC, where it got published on their company website as well. In February, another #ibmcsc team visited Cambodia and worked with a different group of clients, mostly educational institutions. During their preparation I had the pleasure to share some of our team’s experiences, including recommendations for sight-seeing, dining and entertainment. Writing and talking with colleagues, friends and family about the trip always brings back fond memories of the great time spent in Cambodia with the “Tissabamokah” team, our hosts and the various people we met during our stay. I occasionally hear from my friends at HRINC about life and work, and follow the updates from the Cambodia Retirement Village (CRV) project. The IBM team has stayed in loose contact also. We didn’t manage to arrange our first annual reunion that we had talked about before we left, and we never completed our team video. Somewhere that raw footage is waiting to be edited and cut, maybe for another anniversary. If you ever have an opportunity to spend some time on a voluntary assignment, whether as a company sponsored activity or with a volunteer organization like Australian Business Volunteers (ABV), go for it, and if you don’t, try harder to find one. Looking back a year later, I wouldn’t say that one month abroad made me a completely different person, but I certainly learned a few things about myself too. What made the most lasting impression on me was the Khmer people’s positive and cheerful attitude, which I admire and often miss.